Anthony Vitale, a life-long steel worker and internationally know metal sculptor, designed a dial for the place he once worked: Carnegie Steel. He started with a flat length of steel 72 inches long, selected the distance between hour lines to be 6 inches, delineated in 15 minute intervals. The result was an equatorial half-ring 45.836 inches in diameter. He added 3 1/4 inches buffer on each side of the equatorial, creating an outer ring 52 inches in diameter. Along the meridian half-ring, the sun's declination is marked with months when a nodus cross bar casts a horizontal shadow at solar noon. 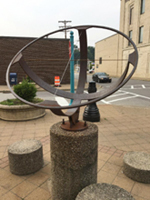 The concrete base can unfortunately be rotated and it seems to point to the magnetic north, but bringing a compass or modern cell phone near the steel armillary instantly creates a distortion. In August 2018 the Historical Society was pleased to help host a visit from the North American Sundial Association. Alyssa Myers, daughter of Beatrice Vitale Schomaker, presented the history of this iconic structure and her grandfather. Pictures of Vitale's original drawings and calculations are shown below.